Thats the first of many of my papercrafts I'm going to make. Of course, the credit for this puppy (teehee) belongs to StarBurst, for showing me the pattern! 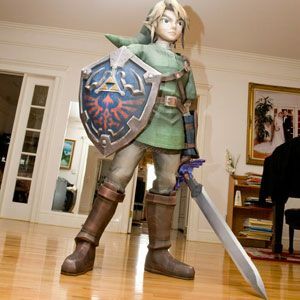 I used to be into papercrafts until I started super detailed link. I was going to try him too but he needed over 400 sheets of cardstock. Oh, I meant the smaller version. The smaller version still requires 41 sheets though. Very cool Becky. I'm going to have to see if I can get those things here, I want a Link!